Food processors have gone from being a luxury item to a nearly essential part of various culinary efforts. 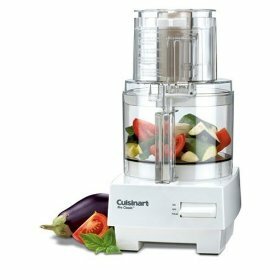 Products like the Cuisinart 7 cup food processor cut down on the time and effort that normal food preparation takes. Just consider one day of chopping, needing or slicing. A good food processor reduces all that manual labor and makes short-work of getting ready for nearly any meal. That means when youre ready to invest in a food processor it will be something you use often! When youre shopping for food processors you want one with good blades, a large enough capacity for your average meals preparation, and the ability to put in both small and large items into the machine. In this respect the Cuisinart 7 cup food processor doesnt disappoint. It comes equipped with a stainless steel chopping and mixing blade as well as a dough blade for bakers. It also has a feeding tube with different sized openings and an alternative cover for when youre just using it to mix things evenly. So if youre tired of having to use 20 different kitchen tools for slicing and dicing, let alone the effort it takes to knead dough, you may want to look into this little machine. Remember that a 7 cup capacity does not mean you can actually put 7 cups of ingredients in this and have it function properly. When over-filled it wont chop effectively and some juices may leak out of the machine. Also the overall assembly appears a little clunky. There have been a few disparaging remarks about the Cusinart 7 cup food processor. Some feel its too small for serious cooks. Others had concerns about the system getting hot when working dough (they wondered if this was a safety issue). Other buyers still said that the power seems lacking for hefty jobs and that the feeding tub is hard to clean thoroughly. Those that like this appliance commented on the 30 minute video that proved helpful for people unfamiliar with food processors in general. These buyers enjoyed the recipe booklet, and the fact that this food processor saves time and effort in the kitchen (i.e. it does what it was intended to do). The Cuisinart Pro Classic costs between $100 and $180. Thats not a bad price considering how much your time is worth (rather than slaving over a mandolin or food masher  have more time with family!). Be aware, however, that the blade on this machine isnt covered by warrantee and you have to foot the bill for getting a new part. (including shipping). Its odd to me that Cuisinart wouldnt stand behind such a key element to the overall functionality of this appliance.